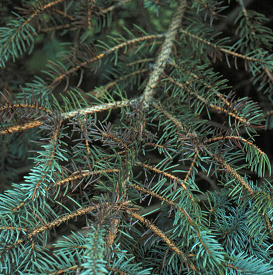 Browning of interior spruce needles caused by Rhizosphaera needle blight. What is Rhizosphaera needle cast? Rhizosphaeara needle cast is one of the most common fungal diseases of Colorado blue spruce. It can make Colorado blue spruce unsightly and unusable in many landscape settings. The disease can also affect other conifers including black, Engelmann, Serbian, Sitka, and white (e.g., Black Hills) spruce; Austrian, mugo and eastern white pine; Douglas fir and western hemlock. What does Rhizosphaera needle cast look like? The first noticeable symptom of Rhizosphaera needle cast is a browning and loss of the innermost needles on the lower branches of spruce trees. Often the youngest needles at the tips of branches remain healthy. Rows of small, black spheres form along the length of infected needles and are visible with a 10X hand lens. These black spheres are fruiting bodies (i.e., reproductive structures) of the fungus that causes the disease and are diagnostic. Where does Rhizosphaera needle cast come from? Rhizosphaera needle cast is typically caused by the fungus Rhizosphaera kalkhoffii, although other species of Rhizosphaera can be involved depending on the host. Infected needles, including those that are still attached to branches and those that have fallen to the ground, produce spores that can be blown or splashed to healthy needles. How do I save a tree or shrub with Rhizosphaera needle cast? Consider treating affected trees with fungicides containing the active ingredient copper (e.g., Bordeaux mixture) or chlorothalonil. Treatments will not cure existing infections, but can prevent additional infections. Apply treatments every three to four weeks starting as new needles emerge in the spring. Continue applications through periods of wet weather. For fungicide treatments to be effective, thoroughly cover all needles. This may be extremely difficult with large trees. Be sure to read and follow all label instructions of the fungicide(s) that you select to ensure that you use the fungicide(s) in the safest and most effective manner possible. How do I avoid problems with Rhizosphaera needle cast in the future? The easiest way to avoid Rhizosphaera needle cast is to avoid planting Colorado blue spruce. If you do plant blue spruce, consider using dwarf varieties and allow adequate spacing between trees so that branches will not overlap when trees are full size. Dwarf varieties and properly spaced larger spruce varieties will have better air penetration and needles will dry more quickly. Dry needles are less likely to be infected. Also check existing spruce trees for the disease. Remove and destroy any diseased branches and needles by burning (where allowed), burying or hot composting.